Con l’arrivo imminente della stagione delle piogge in Bangladesh, sono a rischio oltre 150.000 rifugiati Rohingya in fuga da violenza, torture e abusi subiti in Myanmar. Per aiutarli e scongiurare la morte di migliaia di persone, l’UNHCR lancia la campagna “Sopravvivere è questione di tempo” con l’obiettivo di sensibilizzare l’opinione pubblica e raccogliere fondi a sostegno degli interventi di emergenza per la popolazione dei Rohingya, minoranza musulmana apolide tra delle più perseguitate al mondo. Dal 25 agosto 2017, dopo un inasprimento delle violenze nei loro confronti, 670.000 Rohingya sono fuggiti dal Myanmar per raggiungere il Bangladesh (tre quarti di loro sono donne e bambini), dove sono arrivati esausti, affamati e malati, dopo aver subito la distruzione di case, scuole e moschee, uccisioni, torture, violenze sessuali e di genere. E la stagione monsonica in arrivo puo’ portare una drammatica emergenza nell’emergenza. Si stima che 150- 200 mila rifugiati sono in grave pericolo e possono subire le conseguenze fatali di inondazioni e frane. La campagna dell’UNHCR rivolta al mondo dei social, chiede di condividere un post e la card (in basso) su Facebook, Twitter o Instagram e, volendo, taggare uno/a o più amici invitandoli a fare altrettanto. 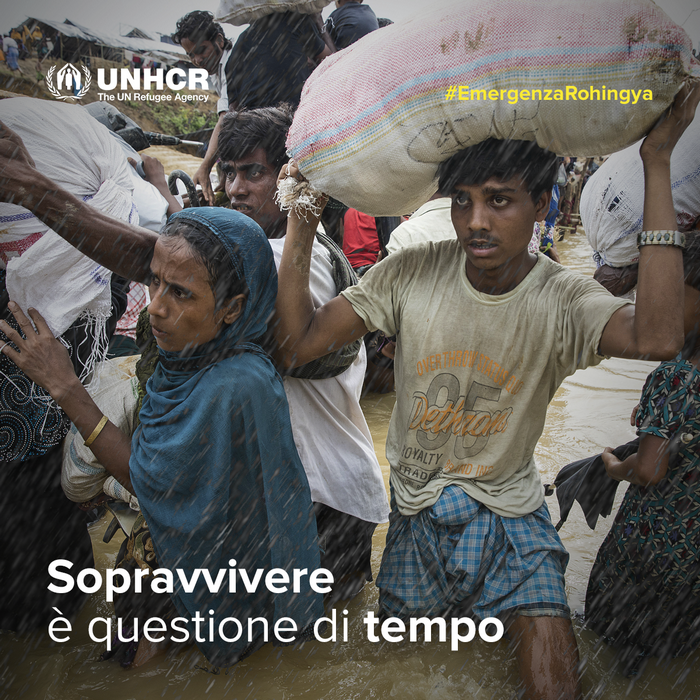 Il post dovrà contenere l’hashtag #EmergenzaRohingya e invitare a donare a questa landing page: “Dona ora su http://bit.ly/emergenza_rohingya ”. 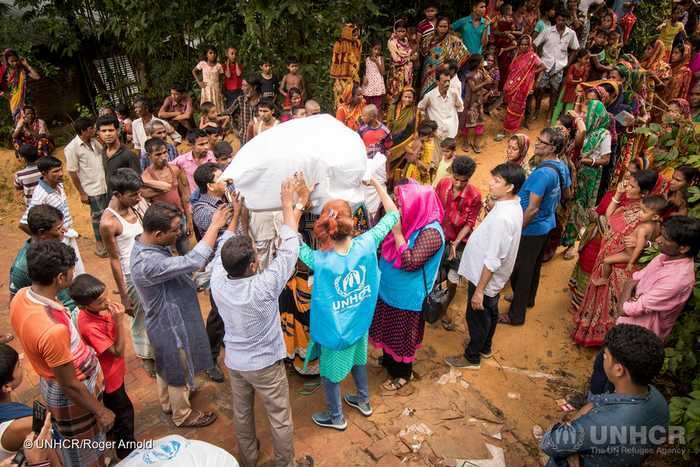 UNHCR aid supplies arrive at Hindu Par Village in Ukhia, Bangladesh, where around a hundred Rohingya families belonging to the minority Hindu faith are sheltering. ; Hundreds of thousands of Rohingya have arrived in camps and settlements in south-east Bangladesh in the space of a month, after fleeing the violence that erupted in Myanmar in late-August 2017. Among them are Hindu Rohingya families who, reports say, have been attacked by Muslim Rohingya insurgent groups. They have fled mostly on foot through forests and monsoon rains, along with an estimated 480,000 other Rohingya who have crossed the border. UNHCR is assisting around 100 Hindu families with aid supplies, in a settlement to the north of Kutupalong refugee camp. A Rohingya father carries his children in a basket as he wades through water crossing the border from Myanmar into Bangladesh, near the village of Anzuman Para in Palong Khali. ; As an estimated 500,000 Rohingya sought safety in Bangladesh between late-August and October 2017, UNHCR worked with the authorities to create a transit centre to prepare for a further influx, as some 11,000 people crossed the border on 9th October. They crossed by land into south-eastern Bangladesh through several points. Many came from the Buthidaung area in Myanmar’s northern Rakhine state. Some said they fled torching and killings. Others said they left in fear ahead of anticipated violence. 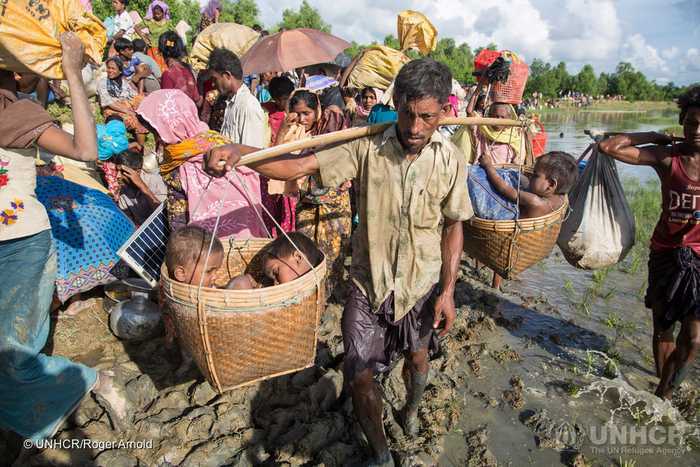 To reach Bangladesh, they walked for days, many carrying children. They waded through marshland before swimming across the Naf river that divides the two countries. UNHCR worked swiftly to accommodate as many as possible in the camps and settlements in Kutupalong and Balukhali, and provided emergency relief items. UNHCR staff members assist thousands of refugees from Myanmar helping admit them to Bangladesh after spending up to four days stranded near the border. Bangladesh border guards reported that over 6,800 refugees had passed through Anjuman Para border village in Cox’s Bazar district. 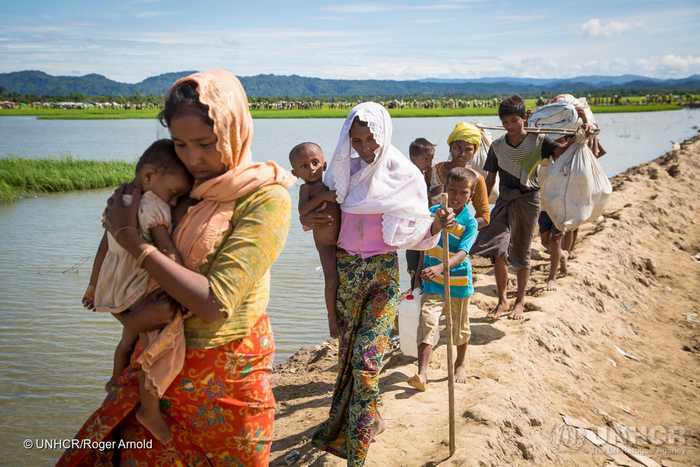 Thousands more are said to be on their way from Myanmar. The most vulnerable refugees were bussed to a transit centre near Kutupalong camp where UNHCR and out partners provided food, water, medical checks and temporary shelter. On Thursday some families moved into UNHCR tents while others slept under covered shelters. Other new arrivals are hosted in Kutupalong refugee camp, spending the night in existing structures and buildings in the camp. 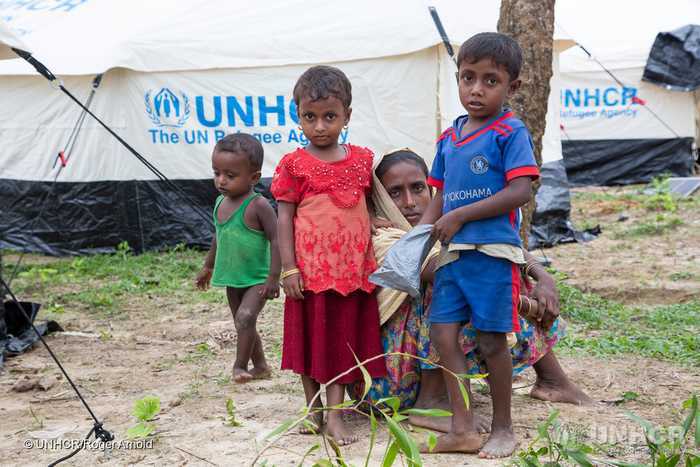 ; As an estimated 600,000 Rohingya sought safety in Bangladesh between late-August and October 2017, UNHCR began work on an extension site next to the long-established Kutupalong refugee camp in Cox’s Bazar. Whole families, young mothers and unaccompanied minors were among those fleeing for their lives since fighting reignited in Myanmar. They came by boat or walked barefoot for days, wading through vast rice fields. They left most of their possessions behind. 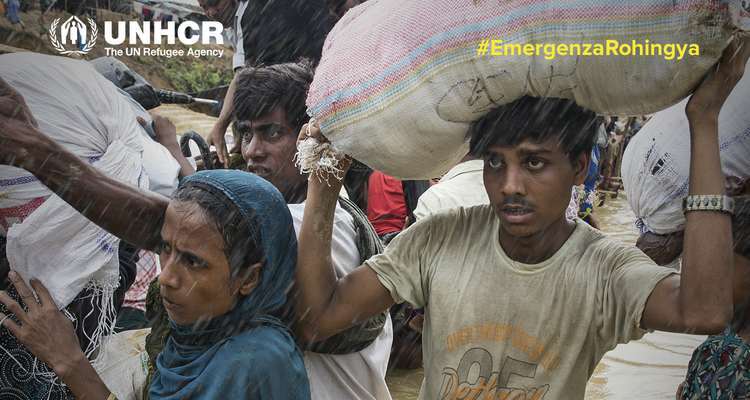 Large groups crossed into south-eastern Bangladesh hungry, in poor physical condition and in need of life-saving support. By mid-September, the Bangladeshi Government allocated some 2,000 acres of land on which family tents and temporary communal shelters were erected to shelter new arrivals. UNHCR site planners estimate that these will be sufficient to house 150,000 people.